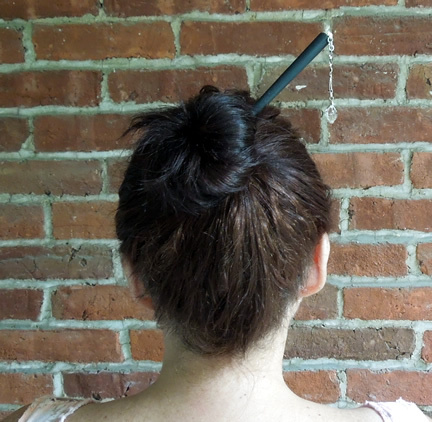 Notes: A water clear and double terminated Herkimer Diamond is a flirty look dangling from this black wooden hair stick. 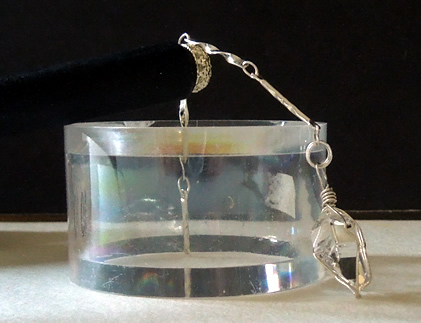 The natural crystal measures 17x14.5x9.5 mm, approximately 12 ct., and is wrapped in sterling silver wire. It's attached to a filigree accent on the stick by a 1.5" silver chain. 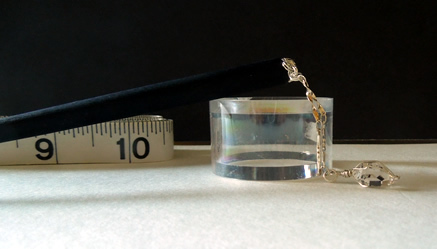 Another small chain dangles along side. The matte black wooden hair stick measures 6" / 15.5 cm. Not only a great look for holding a messy or polished bun, but can also be used as a shawl pin, or even a plant accessory !